iMac & Cinema Display to VESA Mount Adapter + FREE SHIPPING! 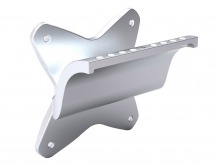 Use any VESA75 mounting bracket with your current iMac, Cinema Display or Thunderbolt Display. Allows you to attach a compatible iMac or Apple Cinema Display to any VESA compliant TV bracket for more choice when mounting iMacs to walls, desks or ceilings. It's a simple matter of removing your current iMac stand (instructions included) and then substituting it for this short adapter kit. Once attached, you have a regular VESA-compliant mounting plate which works with all VESA-100 compatible mounting brackets. That means you're free to use wall brackets with extension arms, desk mounts with swivel pivots and even ceiling mounts. This adapter plate attaches to an existing iMac computer that uses the 8-bolt horizontal attachment system (not included). This adapter changes from iMac to VESA 75 (75mm square). Note: This product requires the 8 bolts which come standard in the iMac stand. Extra iMac mounting bolts are not included with this adapter - only the 4 bolts for VESA mounting and 2 for adapter assembly. G'day Cablechich. It is a pleasure doing business with Cablechick, I have always found them to be totally reliable, honest and exceptionally fast with their delivery's. I will continue with this company whenever I need a specific product. Thank you.